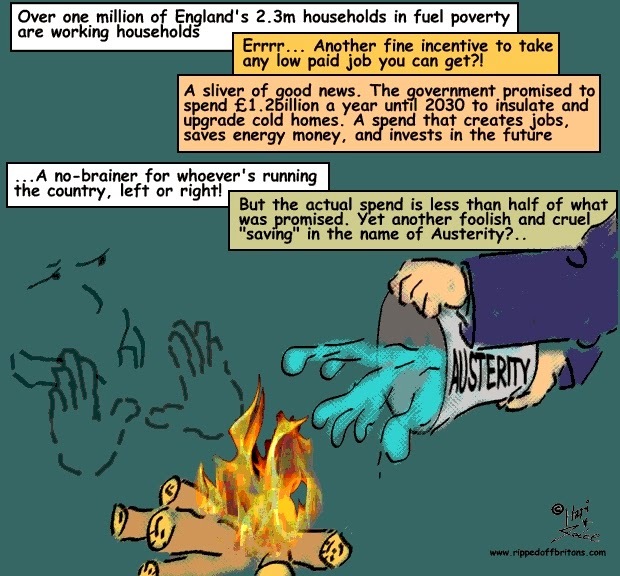 2.3 million households in England are living in fuel poverty. Over 1 million of them are in work. 10% of all households in England are in fuel poverty – but this rises to 19% of households living in private rented accommodation. Fuel poverty has been made worse by rising energy bills – consumer gas prices increased by 128% over the period 2003 to 2013. Despite some recent improvement, the UK’s housing stock remains woefully inefficient compared to other European countries. The report highlights flaws with the current fuel poverty strategy. The government target is to move all fuel poor homes in England to a ‘Band C’ energy efficiency rating by 2030, at an estimated cost of £1.2billion a year. However, the government is spending less than half of what is required (£490million a year) leading to a £700million per year funding gap. "Fuel poverty could claim 100,000 lives over next 15 years, warns energy charity. The NHS could be landed with a £22bn bill as cold homes kill 100,000 vulnerable people over the next 15 years, a charity warns today. National Energy Action reckons at least 30,000 vulnerable people have perished prematurely over this Parliament due to an inability to adequately heat their homes, and Treasury energy taxes will mean many more will die in the next decade and a half unless the next government takes positive action. That’s because millions of low-income and vulnerable households are either in significant personal debt or are in fuel poverty and have to ration their heating. As well as causing acute personal suffering, in its Manifesto for Warmth published today the charity says fuel poverty also reduces economic activity within deprived areas and leaves the NHS currently bearing a yearly burden of approximately £1.5bn treating cold-related illnesses every winter."